Free Shipping Included! New Galaxy 4-Light Antique Black Round Metal Shade Crystal Chandelier Pendant Hanging Ceiling Fixture by New Galaxy at F LED Lights. MPN: Black AJA-L4. Hurry! Limited time offer. Offer valid only while supplies last. 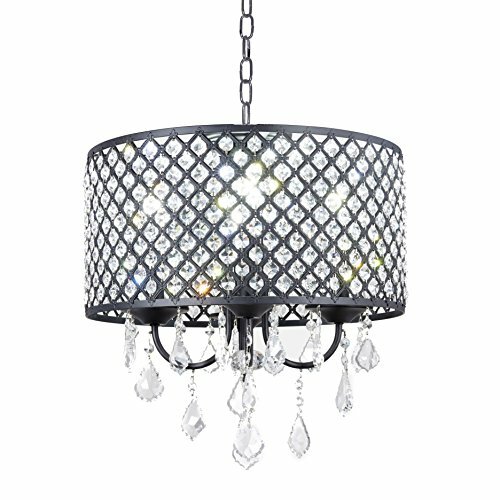 Fixture dimensions:14" Diameter x 13" high or 18" high with crystal hanging; included Chain: 33", Total height: 50"
If you have any questions about this product by New Galaxy, contact us by completing and submitting the form below. If you are looking for a specif part number, please include it with your message.